Dutch St Maarten's prime popular beach resorts extend as a series of sandy bays from Philipsburg along the southwest coast of the island, reaching a grand finale at the great spread of Simpson Bay, site of the international airport. From the headland at the western end of Great Bay stretches the secluded beach of Cay Bay, famed for being the spot where Dutchman Peter Stuyvesant was injured in battle against the Spanish. This quiet beach can only be reached by dirt road or horse trail. Further west, towards the airport, is Simpson Bay Lagoon, surrounded by resort developments. There is also a series of good beaches with fine white sand. Maho Bay is St Maarten's largest beach resort, well developed with facilities, a casino and its popular Sunset Bar. 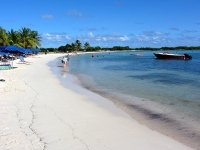 Mullet Bay, with its gentle surf and shady stretch of palm trees, is usually the most crowded beach. Cupecoy is favoured by nudists, and has dramatic sandstone cliffs and caves.